Oldest Credit Union in New Brunswick: In 1929 Reverand AA McKinnon was appointed Parish Priest to St. Raphael’s Parish. One of his first tasks was the building of a parish hall. The price of construction materials had fallen and due to the high rate of unemployment, most of the labour on the hall was volunteered. Father McKinnon took special interest in the youth so he organized a study group to meet on Sunday evenings. They sat around a wood stove in the hall kitchen and discussed topics of the day. In 1935, the Credit Union movement had been tried in Denmark and proved successful. This was also called “the poor man’s bank”. The Credit Union movement was introduced in Nova Scotia by Rev. JJ Tomkins of Antigonish. He traveled through fishing and mining villages along the north shore and talked to groups in private homes and the movement took off. Rev. Tomkins had the help of two other men, Dr. Cody and Father JJ McDonald who were part of the Extension Development. Father McKinnon, being a graduate of St. Francis Xavier University in Antigonish, was extremely interested in this project. So the topic of study in 1935 became Credit Unions. Later that year Dr. Cody and Father McDonald traveled to Blackville to acquaint the study group with the fundamental policies of the movement. Thus the St. Raphael’s Credit Union Society Limited came into being. On September 15, 1936, the Blackville Credit Union received its charter and became the first organization of its kind in New Brunswick. It officially opened for business on September 30, 1936. The membership fee was 25 cents and the member was Charles Ross. Ernest McCarthy held the office of manager until 1948 when Harold Ross took over until 1979. For the first 20 years they carried on the business in their own homes. 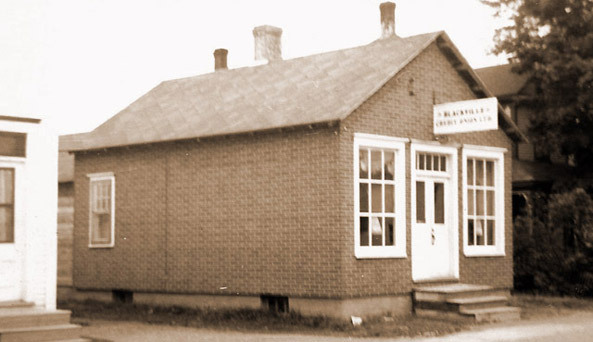 In 1953 the name of the Credit Union was changed to Blackville Credit Union Ltd., thus to include all the people in the Parish of Blackville and adjacent areas. A building was acquired on a rental basis in 1956 and purchased in 1958. The office was open for business on Wednesday and Friday evenings from 7:00pm to 9:00pm. In 1963 the building was renovated and became a full time operation. In 1978 a vault was installed with safety deposit boxes to provide the required security for the business. That same year, the Credit Union had assets amounting to more than half a million dollars with 610 members with Harold A. Ross as treasurer and Frank McCormack as his assistant. Members of the Board of Directors during that time were James Sturgeon, President; and board members Archie Donald, Wilson Sturgeon, Ted Walls, Karl McCormack Sr., James Cavanaugh and Lawrence Stephens. In 1979, Frank McCormack became manager. Renovations on the building were completed in 1979 while business continued to operate. Past managers include Kurt Marks and Kim MacDonald. In 1994, Kathleen Coughlan accepted the position. In 1995 plans were finalized for a new building. Construction began and the Credit Union moved into the existing building in December 1995. Since Kathleen Coughlan’s retirement, Jacqueline Jardine became manager. By 2011, assets grew to 9.6 million dollars and a membership of approximately 2,450. The Board of Directors were: President Kirby Curtis, Vice-President Richard Jardine, Secretary Jackie Vickers, Audit Committee Chairperson Susan McEvoy and Audit Committee members Debbie Gilbert, January Lynch, Rodney Buggie, Heather McCormack and Sharon Vickers and Spare Director Sally Underhill. Staff members: General Manager Jacqueline Jardine, Loans Officer Cindy Ross, Customer Service Supervisor Karen Curtis, Customer Service Representatives Rhonda Jardine, Rachael Walls and Kasandra MacKenzie and Casual Part-Time Customer Service Representative Patsy St-Coeur.